Diffraction gratings are manufactured either classically with the use of a ruling engine by burnishing grooves with a diamond stylus, or holographically with the use of interference fringes generated at the intersection of two laser beams1. Classically ruled gratings may be planar or concave and possess grooves, each parallel with the next. Holographic grating grooves may be either parallel or of unequal distribution in order to optimize system performance. Holographic gratings are generated on planar, spherical, toroidal, and many other surfaces. Regardless of the shape of the surface or whether classically ruled or holographic, the text that follows is applicable to each; explanations are provided where there are differences. Fig. 1: For more details see the "Diffraction Gratings Ruled & Holographic Handbook", published by HORIBA Jobin Yvon Inc.
Before introducing the basic equations, a brief explanation on monochromatic light and continuous spectra must first be presented. Monochromatic light has infinitely narrow spectral width. Good sources which approximate such light include single mode lasers and very low pressure, cooled spectral calibration lamps. These are also variously known as “line” or “discrete line” sources. A continuous spectrum has finite spectral width, e.g. “white light.” In principle, all wavelengths are present, but in practice a “continuum” is almost always a segment of a spectrum. Sometimes a continuous spectral segment may be only a few parts of a nanometer wide and resemble a line spectrum. The equations that follow are for systems in air where μ0 = 1. Therefore, λ = λ0 = wavelength in air. Assuming the value of DV is known, α and β may be determined through Equations (2) and (3) (see Fig. 2 and Fig. 3). LH = Perpendicular distance from the spectral plane to grating. Table 1: Variation of α (angle of incidence) and β (angle of diffraction), with DV (Deviation Angle) at 500 nm in First Order with 1200 g/mm Grating. Table 1 shows how α and β vary depending on the deviation angle for a 1200 g/mm grating set to diffract 500 nm in a monochromator geometry, based on Fig. 2. It is easy to imagine that fine spectral detail would be more easily identified in the first instrument than the second. The second instrument demonstrates “low” dispersion compared to the “higher” dispersion of the first. Linear dispersion is associated with an instrument’s ability to resolve fine spectral detail. where LB is the effective exit focal length in mm and dx is the unit interval in mm along the focal field (see Fig. 2). In a monochromator, LB is the arm length from the focusing mirror to the exit slit, or if the grating is concave, from the grating to the exit slit. Linear dispersion, therefore, varies directly with cos β, and inversely with the exit path length, LB, diffraction order (k), and groove density, n.
In a spectrograph, the linear dispersion for any wavelength other than the wavelength which is normal to the spectral plane will be modified by the cosine of the angle of inclination or tilt angle (γ) at wavelength λn. Fig. 3 shows a “flat field” spectrograph as used with a linear diode array. Fig. 4: Dispersion and Order. If, for example, a light source emits a continuum of wavelengths from 20 nm to 1000 nm, then at the physical location of 800 nm in first order (Fig. 4) wavelengths of 400, 266.6, and 200 nm will also be present and available to the same detector. In order to monitor only light at 800 nm, filters must be used to eliminate the higher orders. 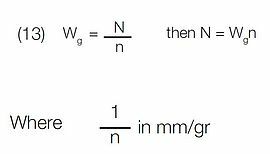 The numerical resolving power “R” should not be confused with the resolution or bandpass of an instrument system. In a real instrument, however, the geometry is fixed by (1). Because bandpass is also determined by the slit width of the spectrometer and residual system aberrations, an achieved bandpass at this level is only possible in diffraction limited instruments, assuming an unlikely 100% of theoretical. Blaze is defined as the concentration of a limited region of the spectrum into any order other than the zero order. Blazed gratings are manufactured to produce maximum efficiency at designated wavelengths. A grating may, therefore, be described as “blazed at 250 nm” or “blazed at 1 micron,” etc. by appropriate selection of groove geometry. A blazed grating is one in which the grooves of the diffraction grating are controlled to form right triangles with a “blaze angle, ω,” as shown in Fig. 5. However, apex angles up to 110° may be present especially in blazed holographic gratings. The selection of the peak angle of the triangular groove offers opportunity to optimize the overall efficiency profile of the grating. Fig. 5: Littrow Condition for a Single Groove of a Blazed Grating. Blazed grating groove profiles are calculated for the Littrow condition where the incident and diffracted rays are in auto collimation (i.e., α = β). The input and output rays, therefore, propagate along the same axis. In this case, at the “blaze” wavelength λB. Fig. 6: Efficiency Curve of a Blazed, Ruled Grating. Fig. 7: Efficiency Curve of a Non-blazed, Holographic Grating. See Fig. 6 and Fig. 7 for typical efficiency curves of a blazed, ruled grating, and a non-blazed, holographic grating, respectively. A grating blazed in first order is equally blazed in the higher orders. Therefore, a grating blazed at 600 nm in first order is also blazed at 300 nm in second order, and so on. The efficiency also decreases the farther away from Littrow conditions in which the grating is used (e.g. α ≠ β). Holographic gratings may be designed with groove profiles that discriminate against high orders. This may be particularly effective in the UV and VIS using laminar groove profiles created by ion etching. Note: Just because a grating is “non-blazed” does not necessarily mean that it is less efficient! See Fig. 7 showing the efficiency curve for an 1800 g/mm sinusoidal grooved holographic grating. Light other than the wavelength of interest reaching a detector (often including one or more elements of “scattered light”) is referred to as stray light. Focused stray light due to non-periodic errors in the ruling of grating grooves. Fig. 8: Stray light of ruled grating and holographic grating. Ghosts are focused and imaged in the dispersion plane of the monochromator.Stray light of a holographic grating is usually up to a factor of ten times less than that of a classically ruled grating, is typically non-focused, and when present, radiates through 2π steradians. Any time groove density should be 1200 g/mm or more (up to 6000 g/mm and 120 mm x 140 mm in size); for use in the near UV, VIS, and NIR spectral regions. Whenever an ion-etched holographic grating is available. When working in the IR above 1.2 μm, if an ion etched holographic grating is unavailable. 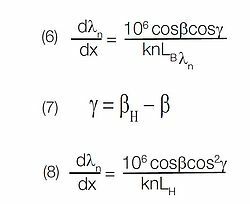 Remember, ghosts and subsequent stray light intensity are proportional to the square of order and groove density (n2 and k2 from Equation (17). Beware of using ruled gratings in high order or with high groove density. Diffraction Gratings Ruled and Holographic Handbook, published by HORIBA Jobin Yvon Inc, Edison, New Jersey 08820 USA and Jobin Yvon Div. d’ Instruments SA., 16-18 Rue du Canal 91160 Longjumeau, France. Chi, Chang H., Ed., “Periodic Structures, Gratings, Moire Patterns and Diffraction Phenomena,” SPIE Proc. 240 (1980). Goldstein, S. A. and Walters, J. P., “A Review of Considerations for High Fidelity Imaging of Laboratory Spectroscopic Sources - Parts 1 and 2", Spectrochimica ACTA, 31B, 201-316, (1976). Hecht, E. and A. Zajac, Ontics, Addison Uesley, Reading, Massachusetts, ITRA (1979). James, J. F. and R. S. Sternburg, The Design of Optical Spectrometers Chapman & Hall Ltd., London, England, (1969). Lerner, Jeremy M., Ed., “International Conference on the Application, Theory and Fabrication of Periodic Structures, Diffraction Gratings and Moire Phenomena,” SPIE Proc. 503 (1984). Lerner, Jeremy M., Ed., “International Conference on the Application, Theory and Fabrication of Periodic Structures, Diffraction Gratings and Moire Phenomena,” SPIE Proc. 815 (1987). Reader, J., “Optimizing Czerny-Turner Spectrographs: A Comparison Between Analytic Theory and Ray Tracing,” J. Opt. Soc. Am. 59, (9), 11891196. (1969). Reader, J., “What is Dynamic Dispersion,” Applied Optics 20, (13), 21732172, (1981). Shafer, A. B., Megill, L. R., and Droppleman, L.,“Optimization of the Czerny-Turner,” J. Opt. Soc. Am. 54, (7), 879887 (1964). Stroke, G. W., Handbuch der Physik XXIX, Springer Berlin, (1967), (Chapter in English). Thevenon, A., Flamand, J., Laude, J. P., Touzet, B., and Lerner, J. M., “Aberration Corrected Plane Gratings,” SPIE Proc 815, 136145, (1987).